Mario versus Donkey Kong-- one of gaming's oldest rivalries. The original Donkey Kong was released to arcades in 1981 successfully entering Nintendo and now heavily-praised game designer Shigeru Miyamoto into the gaming world. It would be another decade and some change before a true sequel would be made. This title was released for the Game Boy in 1994 keeping the original name and classic arcade look and feel, but altering the gameplay quite a bit. The game received rave reviews and was loved by many a Kong-fanatic. 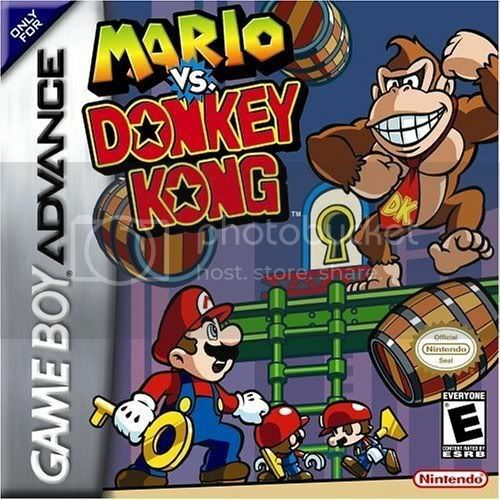 A decade later in 2004, as if marking the ten year anniversary of the Game Boy installment, Nintendo and NST teamed up to create an all-new installment with the appropriately titled Mario vs. Donkey Kong for the Game Boy Advance. Does this title still have that monkey magic, or is this gorilla barking up the wrong tree? It looks simple now, but wait until you play some more. No longer addicted to kidnapping Pauline, Donkey Kong has sort of devolved from desiring damsels to developing a fixation for the latest toy obsession: Mini Marios. Rather than purchase the toy for himself with all those banana coins his Kong family earned while messing about in the Donkey Kong Country series, he loots the entire factory of Mario's miniature playthings (no, not those miniature playthings! ...Pervert.). Now it's up to Mario to shake out those cobwebs and remember all those tricks from his Jumpman years as he sets out to take those toys back through six worlds of challenges, trials, and tribulations. Mario vs. Donkey Kong may seem quite familiar to the original Donkey Kong and definitely the 1994 version. NST obviously followed the textbook design of the Game Boy entry down to the jumping and platforming. However, the GBA game is a completely new experience with brand-new levels and obstacles to overcome. The wrapping may be familiar, but the gift is completely new. The second world pits you against fire-spitting Piranha Plants. As previously stated, there's six worlds. Each world has eight levels (48 levels initially)-- the first six being Mario challenges levels, the seventh is a Mini Mario level, and the final level is a boss battle against the big ol' ape himself. The Mario levels all follow the same pattern in that they're split up into two stages. 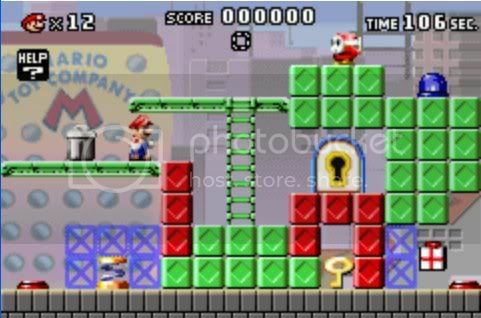 The first stage has Mario faced with a locked door. It's his job to pick up a key, navigate it through the level, and open up the locked door. The second stage is one where Mario will need to break a Mini Mario free of its crystal sphere captivity in order to complete the level. In each of Mario's levels there's three packages placed in strategic spots for the plump plumber to collect. Sounds simpler than it actually is. Each level always brings some new obstacle, enemy, challenge, and/or twist to the formula to keep things fresh. An opening movie at the introduction of each level shows a new trick that players might not have known about. Others make you wonder if the developer is questioning your intelligence. Mario will need to learn how to shimmy up ropes, learn how to trapeze on horizontal bars, pick up various items needed to reach higher areas, and dodge enemy fire. Besides teaching an old dog (or plumber in this case) new tricks, there's new challenges such as conveyor belts, timed lasers which go off intermittently, donut platforms which fall after Mario's on them for enough time, multi-colored switches that change the layout of the level, and enemies to worry about such as Shy Guys, fire blasting Piranha Plants, haunting Boos, floor-crashing Thwomps, exploding Bob-Ombs, and many more. In addition to all of this, you're being timed. The faster you complete a level, the better your score. The better your score, and you might beat the high score which nets you a star. These stars unlock expert levels after the main adventure has been completed. I'm having flashbacks of Super Mario Bros. 3. And to beat those expert levels you'll need to have some impressive moves, right? The moves from Donkey Kong '94 are all here and accounted for. 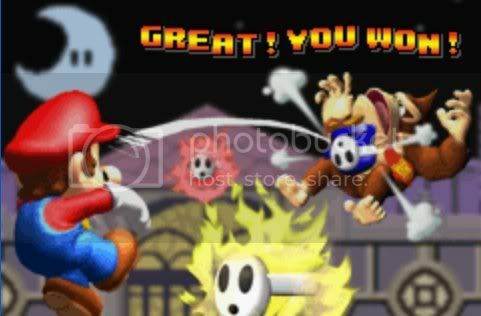 Mario can jump on top of most enemies, pluck them up Super Mario Bros. 2-style, and chuck them into other foes or toss them atop some spikes, using the enemy's back as a means across the otherwise hazardous spikes. 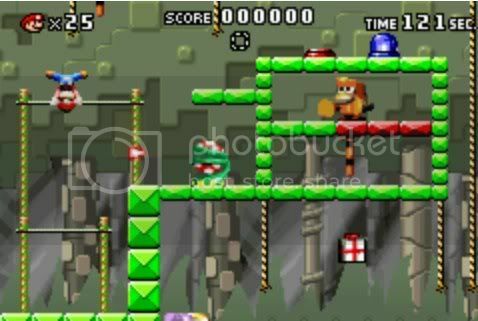 The hammer is a staple of the classic Donkey Kong formula, and it returns for this installment allowing Mario to plow through enemies effortlessly. A cool twist on the hammer is that you can toss it up into the air, climb up a ladder, and then catch it in order to clobber enemies on a higher elevation. This is a necessary feature in later levels. What moves are new here are ones that Mario's used on his 3-D ventures. While he can't wall jump, Mario can perform other means of acrobatics such as triple and super jumps. Mario will also need to flip and walk on his hands to ward off falling cinder blocks with his feet in some levels. The latter two types of levels are Mini Mario challenges and battles with Donkey Kong. The Mini Mario stages have Mario guiding a sextuplet of Mini Marios to a toy chest. Along the way there's enemies to fiendishly avoid and T, O, Y letters to collect before the toy chest is unlocked for the Mini Marios to hop into and for Mario to complete the stage. The battles with Donkey Kong are the least creative of the types of levels. These are confrontations where the goal is to toss objects at Donkey Kong while trying to survive. Since the game awards points for how much health you have left, the secret of battle (and the best score) is to try to come out untouched. This is easier said than done as each fight is different than the last. The first world is as simple as tossing barrels into DK. The second has you climbing on ropes, dropping hanging fruit and timing your drops onto the mangy monkey below. At first glance, you may be doing the math in your head... six worlds, eight levels each, so that must mean there's 48 levels in all, right? Well, thankfully that isn't so. After completing the game once there's a mode where you play with the Mini Marios through all the preliminary levels. After that, depending on how many stars for high scores you've acquired, there's the damn difficult expert levels to wrap your brain and thumbs around, so there's a lot of content and bang for your buck. Donkey Kong and its 1994 incarnation both used simple graphics and simple design. Mario vs. Donkey Kong attempts to differentiate itself by using a wildly different art style. The characters are 3D rendered models just like Donkey Kong Country but obviously not as detailed or dynamic. I would have preferred 2D sprites as the models just feel out of place-- especially for something as simple as past efforts. The sound department isn't too hot either. The music is largely forgettable save for the main theme which is a combination of the Super Mario Bros. and Donkey Kong themes. Another note, Mario and Donkey Kong must have had SO much they wanted to say to each other during the arcade and 1994 games because they talk A LOT during Mario vs. Donkey Kong. They (mostly Mario) are almost overly chatty. Regardless, I was just amazed that they could pack in so many voice samples into the game. Mario vs. Donkey Kong does an excellent job of differentiating itself from the original arcade and Game Boy Donkey Kongs while simultaneously keeping a familiar aura about it. The game gets quite challenging later on, and it's more about knowing the correct path to take than overly complicated levels. There's a lot to do, there's many high scores to attain, secret levels to discover, and hours of gameplay to sink your paws into. The presentation might not be optimal, but it's not an excuse for anyone to miss out on this great Game Boy Advance game. Hopefully you can hunt it down under fifty bucks (or acquire it by other means) as this is one of the rare ones. 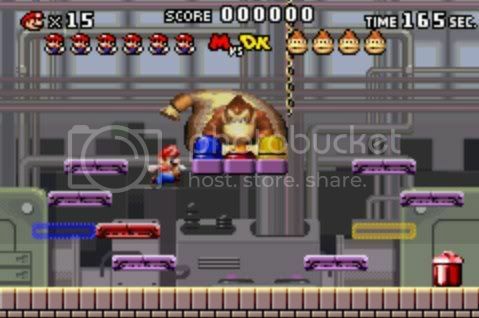 Story: Fed up with kidnapping foxy women, Donkey Kong steals all of the Mini Marios from the factory. Graphics: 3D rendered models look out of place, but everything else looks great. 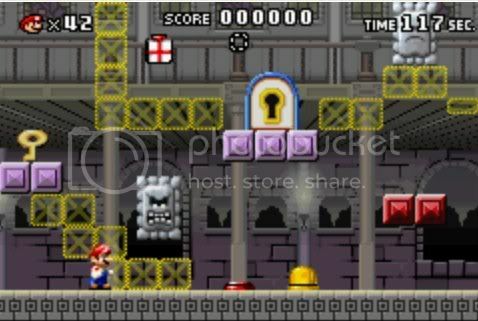 Gameplay: Mario's a one hit kill kind of plumber in this game, so plan your moves carefully. Sound: The music is largely forgettable, and Mario is one that you may want to put a muzzle on eventually. Replay Value: 48 levels to start with with over 100 in all. Square-Enix isn't exactly known for cranking out new franchises and IPs yearly, so when a new one in The World Ends With You was announced the entire gaming world performed a spit-take. Well, maybe that's diving a bit into hyperbole, but you get the gist of things hopefully. 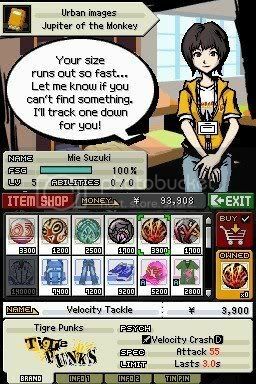 Now very few were surprised to find out that the game would be an RPG, but what did interest folks was that the game would be placed in modern day Shibuya-- an urban setting. Really, I can only think of two titles of the RPG variety that were set in a metropolis: you had Earthbound's Onett and Persona 3's cityscape. Couple this with Tetsuya Nomura's character design, and you have an interesting little package. 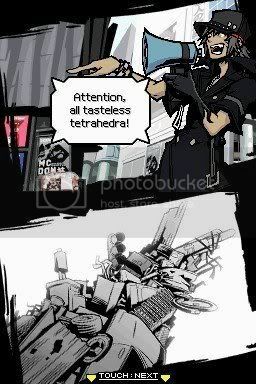 Is The World Ends With You's world one that you won't want to end, or is it one that should face erasure? The story centers around the Reapers' Game, a seven-day. You see, there's two different versions of Shibuya. One is the tangible everyday Shibuya that folks live their lives in known as the RG or Real Ground. The other is The Reapers' playground, the UG, or Underground. The Reapers are a group of unkind folks who grab involuntary people from the RG, take what said people care for most as an entry fee, and put them through a week-long ordeal full of challenges and tests. Fail to complete a task on a given day, and you are permanently erased from existence. Yeah... I think I'll stick to a nice game of Connect Four instead, guys. Players in the UG cannot interact with folks in the RG. However, with a special pin each player receives they can read RGer's minds, help influence their decisions, and even view the negative thoughts of people turned monsters known as Noise. Put in the middle of this is a bewildered, antisocial, young youth in Neku Sakuraba waking up in the middle of a busy crossing in the trend-setting part of Tokyo known as Shibuya. He's the type of 15 year-old who loathes people, would be happy to be alone, and sees no need to rely on other people. As par for Japanese RPG protagonists, Neku has completely lost his memory so he has no idea how he wound up unconscious or inside the game for that matter. Suddenly, he's attacked by a group of frog Noise. He escapes, but the Noise eventually surround him, blocking off all routes of retreat. With nowhere to go, Neku fears the worst, but a young girl named Shiki teams up with him in the nick of time-- eliminating the Noise together. The Reapers' Game requires players to partner up so Neku reluctantly decides to join up with Shiki, and thus this shaky partnership begins. Their goal-- to survive seven days in the Reapers' twisted game. The game has a wonderful if sometimes cryptic story. As Neku teams up with new partners, you get to see different sides of him. Each of the main characters in the story evolve and mature by the end of the game. Neku's cold attitude about the triviality of having friends and Shiki's desire for an identity all change and alter to the player's satisfaction. The aim of each day is to pass the task given to you by the GM-- the game master. The game master creates the missions each pair of players have to complete. 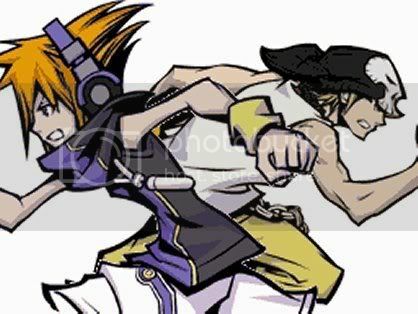 However, only one player pair needs to accomplish a given mission, and sometimes the story will have Neku and his partner in this situation-- relying on someone else to pull through. Most missions are simple. They're either defeat a certain Noise or reach a certain area. Some missions evoke cryptic clues which Neku and his partner must figure out. Each mission has a time limit, but it's all for story purposes as you can take as long as you want to finish a task with no penalty. What you wear is important. Isn't that the kind of life lesson we shouldn't teach our kids? Neku doesn't get the luxury of having all of Shibuya open to him until much later in the game. There's invisible walls set up by red-hooded Reapers that can only be opened by completing one of their tasks such as possessing a certain pin, wearing certain fashion, or clearing an area of Noise. Random encounters are a thing of the past, and since this game is set into modern times it certainly makes sense that the old-school way of doing things in RPGs is obsolete. By tapping the pin in the bottom right corner of the screen, Neku scans the area for Noise. By tapping on one, he and his partner enter into a battle. Shibuya is a town built upon fashion, and it certainly shows in The World Ends With You. Rather than helmets and armor, you equip handbags and jeans. Each character has four slots of goods to equip them with. Each piece of clothing as well as the pins you use have a clothing label tied to them. Certain clothing labels are hotter in some areas of Shibuya than they are in others, and these will affect your attack and defense. Some will give you double the power, while others will substantially lower it. By the midpoint of the game you can actually influence the fashion trends yourself to give you a succinct advantage in battle. Then there's food. Food gives Neku and his partners increased abilities like HP, attack, and defense, but the catch is that they need to be digested first through battle. Pins get regular experience when equipped in battle, but they can also get experience from the time you last played to the time you resume your data. You can also either reduce the difficulty of the game or your own level in order to increase experience and the likelihood of your enemies dropping rare pins. There's even a cool feature that you unlock later in the game that allows you to retry battles that would normally give you a game over. This is great for battles you just lost, but don't want to sit through a cutscene all over again. Focusing on two screens might be problematic at first. 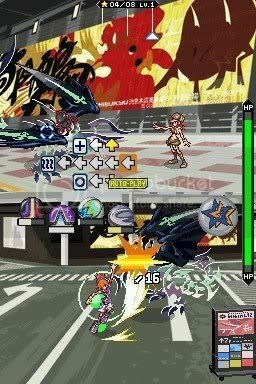 The gameplay focuses on fast, fun, and frenetic battles that take place on both of the DS' screens. Your partner is on the top, and Neku is on the bottom. You both share the same life bar, but fortunately defeating an enemy on one screen eliminates them on the other. 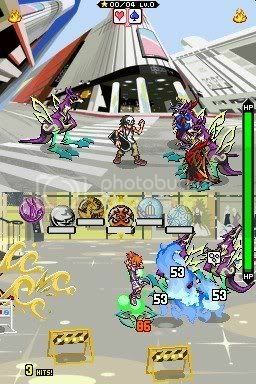 You use the stylus to move Neku around and initiate attacks while at the same time using the D-pad to attack enemies on the top screen as Neku's partner. Take it as rubbing your belly with one hand and patting your head with the other except not as easy to get a grasp of. It is possible, but thankfully you can have the computer take over and attack automatically. You can pass a green ball from one person to another to boost attack strength. You'll most likely get into a groove to keep the ball in play to keep attacking foes with boosted power. You can also set each other up for powerful dual-screened attacks which harm every Noise on both screens. Equipped pins level up and grow stronger-- even when the power's off! Pins are simply attacks and abilities. They're either support (healing) or attack. There's a wide variety of them, and they gain experience along with Neku. Some can even evolve into even more powerful pins. You can only hold a meager amount at the beginning of the game, but towards the end you can have more than five in your arsenal at a given time. Pins are activated by drawing a certain symbol over empty space, dragging the stylus across enemies, slashing Noise with the stylus, shouting (or blowing) into the mic, and a variety of other ways and abilities. Pins can only be used a certain number of times before they need to reboot which takes just a few seconds normally. New pins are constantly added to stores as you play through the game, defeat Noise on higher difficulty levels, and win them from completing missions. I have had some difficulty with inputting various stylus pin commands. I would correctly draw a symbol or whatnot but the game wouldn't register it-- I'd have to redo the symbol or attack. I also had problems using the wrong pin, but thankfully an item is earned which lets you switch between active and inactive pins with the hit of the L or R button. This guy along with Beat are my favorite characters. The first game I thought of when playing The World Ends With You is the Dreamcast classic, Jet Grind Radio. Both have a Japanese "street" aesthetic to them, and both work very well. Environments are nice and detailed taking sometImes exaggerated views of buildings and streets. Townsfolk mingle around with a large number of different-looking sprites. Character models can occasionally get lost within the bustling denizens of Shibuya-- it gets so packed. The Noise themselves are colorful and are well-designed with clever tattoo designs for wings or tails. Battle chugs at a nice pace with little in the way of framerate drops. Cutscenes involve the top screen where 2D character portraits shooting off comic book-styled cartoon bubbles with the rare voice clip/grunt. Big cutscenes are usually short, use a quick animation of some sort, and utilize both screens. The soundtrack is a mishmash of various styles-- mostly Japanese hip-hop, pop, and electronica. The music very much syncs with the world of Shibuya, and even if some of the songs are grating at best, overall there's a very good collection of music here. There's no "one" battle theme for the game or "one" Shibuya theme. There's just a mix of songs that plays for battle and for exploring Shibuya. There's some funny dialogue exchanges during battle such as "Follow my lead", "Screw that". I laughed a few times. The voice work is good, and it serves its purpose well. Even without headphones the entire sound package is well above average. It just sounds great, and with headphones, it's even better. 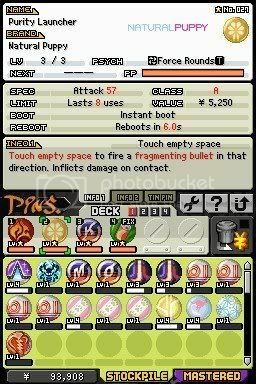 The World Ends With You is an incredibly original game with a fresh and interesting story, characters that start as annoying but grow on you, a fantastic and fast battle system, well-implemented stylus controls (for the most part), a pumping soundtrack, and hours upon hours of time to invest towards completion. It may not be without its caveats, but they don't hinder the experience enough to ruin the package for any DS owner. This is a must-own game. Story: An original story of identity and trust. I was quite surprised. Graphics: Well-designed 2-D sprites for both characters and Noise. Gameplay: Some stylus pin functions don't register the first time around, or they occasionally use a different attack than I was intending. This isn't a huge problem though. Sound: A great soundtrack with few truly annoying songs. The voice clips are small, but they pack punch when used correctly. Replay Value: There's a New Game + mode, a Tin Pin Slammer minigame, and new missions and secret bosses to test your mettle on. Welcome to SuperPhillip Central's New Blog. In addition to posting news on the forum, I'll also be keeping up with this blog. I'll be showing off new reviews, new lists, and new ramblings about anything and everything video games (mostly reviews). Look for the next update sometime tomorrow. Could be an old review, could be a completely new one! This is my cumulative list of reviews that have been posted on the SuperPhillip Central Blog. Every review is in alphabetical order and listed under the platform it was released on. Multi-platform games will be listed under each platform applicable. This list is a constant work-in-progress and will be updated with each new review posted.